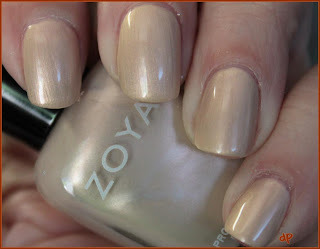 The one with Zoya Buffy! Happy Monday! Did everyone have a great weekend? I took a break from I am... Saturday because my son has been ill. We've had him on a steroid, an inhaler, fever reducer....the kid is drugged up! haha His unexplainable fever lasted all weekend. We still have no idea what happened. But he was able to pick a winner of the Name my GITD Franken contest! There were so many great names that I couldn't decide! I left it up to my little guy, and he picked - LITE BRITE - submitted by Wendy Wright! BUT because I know I can do this now with a GITD polish as base, I will more than likely franken more ... so I can put the naming abilities of my lovely readers to use again :) But now ... on the polish! IT'S ZOYA WEEK! First up is a color I really only bought for the name - Buffy! It's no secret that my favorite TV show has been, and always will be, Buffy the Vampire Slayer ... so I hope to some day have Zoya polishes named for all the female characters from Buffy. This polish is described on Zoya's website as "Pearly warm champagne blonde with subtle pink duochrome and frosty silver shimmer. A unique neutral shade that's both clean and edgy." Pictured is three coats. Application is smooth like butter on this one, as is the case with most Zoyas. 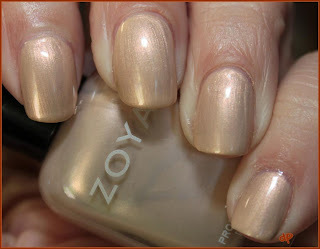 Zoya is available online and certain other stores, like Ulta and Whole Foods.